President Obama has nominated Carla D. Hayden as the new Librarian of Congress. “Washington state lawmakers have about two weeks to come up with a fix that will keep eight charter schools serving about 1,200 students open after the state Supreme Court struck down Washington's charter school law last year,” says Politico. The Chicago Board of Education has unanimously approved the addition of computer science as a graduation requirement for all CPS students beginning with next year’s freshmen. Via The Washington Post: “Never finished college? Washington state lawmakers want to help.” “Dean Dad” Matt Reed has more thoughts on a proposed law that would cover the cost of degree completion for students who are fifteen or fewer credits away from graduation. “Trump on witness list in fraud case against now-defunct Trump University,” reports Politico. Via Slate: “The People Donald Trump Allegedly Ripped Off Through Trump University Look a Lot Like Trump Voters.” Ouch. “How easy should it be to fire bad teachers?” ask The LA Times’ Howard Blume and Joy Resmovits in their coverage of the appeal of Vergara v California. More in The New York Times on the court case. “Add Maryland to the list of states to find that students tended to score better when taking the 2014–15 PARCC exams on paper instead of by computer,” Education Week reports. edX touts its Global Freshmen Academy partnership with ASU, and that's the only quasi-MOOC news I have this week. Edit: Wait! Breaking news! After I hit "publish" on this article, I checked my email to find the headline "Welcome to The New Udacity." Udacity has a new logo, you guys! “America’s Most Valuable For-Profit College Has A New Plan To Go Non-Profit,” writes Buzzfeed’s Molly Hensley-Clancy. 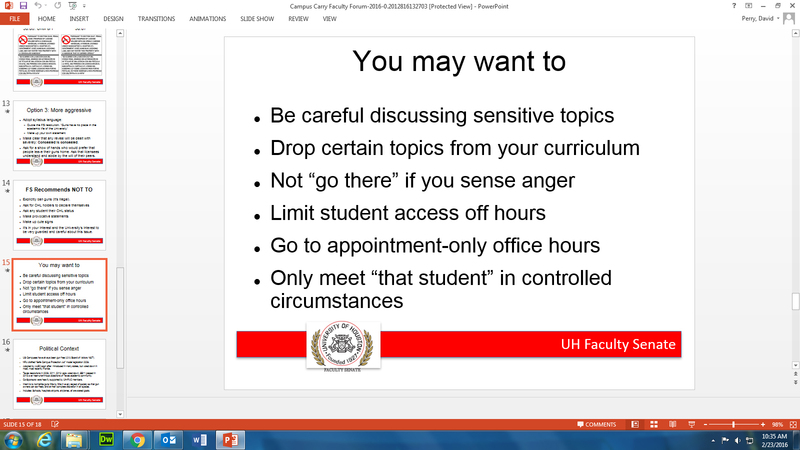 That’s Grand Canyon Education, which runs Grand Canyon University. Just a couple of months after Vox pronounced that “David Geffen’s $100 million gift to UCLA is philanthropy at its absolute worst,” Fusion declares “Nike founder Phil Knight's $400 million gift to Stanford is philanthropy at its worst.” More on Knight’s donation, which is “meant to improve the world,” in The New York Times. 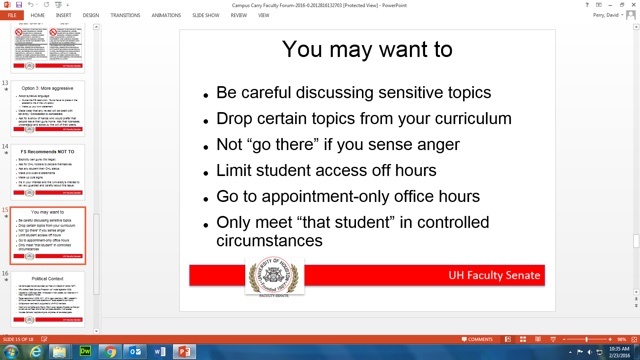 David Perry has published a chilling set of slides from the University of Houston explaining how faculty should respond to the new law-of-the-land in Texas that allows people to carry concealed weapons on (public university) campuses in the state. Harvard will no longer use the phrase “house masters” to describe dorm administrators. Via ProPublica and The Chronicle of Higher Education: “Who’s Regulating Troubled For-Profit Institutions? Executives at Other Troubled For-Profit Institutions.” What could possibly go wrong? “Protesting students at South Africa’s North-West University set fire to various university buildings on Wednesday, completely destroying the administration building and forcing the university to close its campus in Mafikeng indefinitely,” Inside Higher Ed reports. More via The Guardian. “California’s Sierra College is partnering with community makerspace Hacker Lab to offer an immersive bootcamp for entrepreneurs,” reports Campus Technology. “Career Technical Education has transformed high school,” says The Desert Sun. “The authorities in western New York are investigating whether fraternity hazing played a role in the death of a 21-year-old Buffalo State College student from Brooklyn,” The New York Times reports. More in The New York Times about Success Academy’s disciplinary practices. The New York Times examines college endowments and how well they perform. Via The Salt Lake Tribune: “The University of Utah roiled fans across the state – and in the Capitol – when it yanked Brigham Young University from next season’s basketball schedule. Now, lawmakers are taking the Utes to task with a sweeping probe of the college’s sports department.” More via The Chronicle of Higher Education and Inside Higher Ed. The West Virginia Senate has passed legislation that would home-schooled students to join sports teams. It’s called the “Tim Tebow” bill, because of course it is. Rosemary Feal will be stepping down as the executive director of the MLA, effective summer 2017. “University of Missouri curators vote to fire Melissa Click,” the Columbia Daily Tribune reports. Click was videotaped asking a student journalist to leave the area during last year’s protests at Mizzou. More on Click via The NYT. Lila Tretikov has resigned as executive director of the Wikimedia Foundation, a position she’s held since June 2014. “Who’s Raking in the Big Bucks in ‘CharterWorld’?” asks John Merrow, investigating how much charter school administrators are paid. It’s time once again for the Google Science Fair. “Dear Blackboard,” writes Mindwires Consulting’s Michael Feldstein. “I am confused.” Executives at the company have since offered him some clarity. Feldstein also writes about the “One Thing Blackboard is Doing Right” which he contends involves the LMS’s (PR) work on learning analytics. “Students Are Spending Less on Textbooks, but That's Not All Good,” says Mindwires Consulting’s Phil Hill. “Textbook Diversity May Be Increasing Under Common Core,” suggests Education Week. “Are Bootcamps the Answer to the ‘Skills Standoff?’” asks a venture capitalist in an op-ed published by Pearson… so I think we can tell where all this is going. The Computer Science Teachers Association has made its proposed CS standards for K–12 available for review. The digital divide means a “homework gap,” and The New York Times is on it. Edsurge interviews the CEO of Nearpod, which has recently pivoted to offering “virtual reality lessons” (which appear to me to be powerpoint slides that you can look at through one of those cardboard viewers.) “This is such an exciting new product,” Edsurge gushes, calling it the first publicly available VR tool for schools and demonstrating perfectly how some folks continue to ignore and/or rewrite the history of ed-tech. PBS is setting up a 24/7 kids channel. Because the history of the future of education is always broadcast. MasterClass has raised $15 million from New Enterprise Associates, Javelin Venture Partners, Harrison Metal, Bloomberg Beta, Novel TMT Ventures, Advancit Capital, WME Ventures, Downey Ventures, Usher, Yan-David Erlich, and Matthew Rutler. The startup, which offers online classes from famous people, has raised $21.4 million total. “Bengaluru-based student microlending startup Buddy has raised $500,000 (Rs 3.4 crore) from venture capital firm Blume Ventures, data analytics company Tracxn Labs and a few angel investors,” reports The Hindu. Udemy has acquired TalentBuddy. Terms of the deal were not disclosed. Follett has acquired online bookstore Classbook. Terms of the deal were not disclosed. Test prep provider Toppr has acquired test prep provider Manch. Terms of the deal were not disclosed. “Pearson Business Strategy Assailed by Investors, Including Chicago Teacher’s Pension Fund,” Education Week reports. Chegg stock hit an all-time low. Organization comprised of college bookstores find that faculty love textbooks. News at 11. That is, the Independent College Bookstore Association released a report at its retail conference saying that faculty are still skeptical about digital course materials and are unfamiliar with OER. Elsewhere in totally independent research, Facebook released a report on the state of Internet connectivity. Via The Chronicle of Higher Education: “Better Advising Beats Free Tuition for Improving Degree Completion, Say Experts.” Experts, lol. Via Inside Higher Ed: “New Survey of Higher Education ‘Insiders’.” Insiders, lol. “Student Loan Borrowing Is Skyrocketing for Black Students,” says Nerdwallet. From The Washington Center for Equitable Growth: Mapping Student Debt. More on this project via Inside Higher Ed.